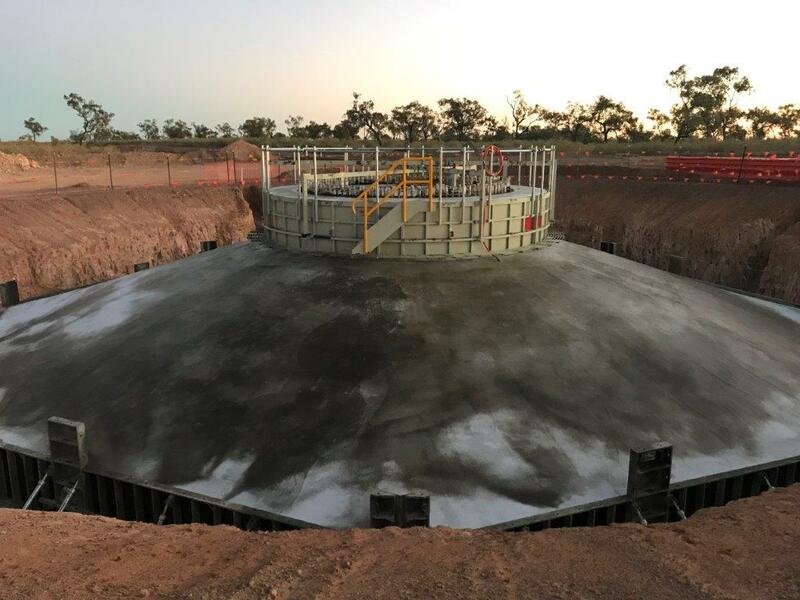 Nacap Australia is well advanced in pouring the concrete foundations for wind turbine generators at the $160 million Kennedy Energy Park at Hughenden. Nine of the 12 WTG foundations are now in place, using 20,000 tonnes of concrete, 808 tonnes of steel reinforcing and 7500 tonnes of sand. Each foundation will support a 200m high wind turbine. “Actually laying the foundations for our WTGs is a ground-breaking milestone,” Nacap president Matthew O’Connell said. Building each foundation involves the excavation of more than 3610 tonnes of earth, the use of 1680 tonnes of concrete and more than 67 tonnes of steel reinforcement. The project will combine 12 wind turbines, 55,000 solar panels, and 4MW of lithium Ion Tesla battery storage to produce up to 60MW of renewable energy. The Kennedy Energy Park is being developed by Windlab and its equity partner Eurus Energy Holding Corporation of Japan, with construction jointly managed by Vestas and Quanta. It is using 12 Vestas V136, 3.6MW turbines at a hub height of 132ms; the largest wind turbines yet to be deployed in Australia. Thirty-six wind turbine blades, each about 70m long, and other cargo for the project arrived at Townsville this month. NSS discharged the cargo, working alongside Rex J Andrews Transport. “Transporting the wind turbine blades is a complicated logistical feat and we are thrilled to be part of such a momentous occasion for the region,” Port of Townsville acting general manager business development Maria James said.